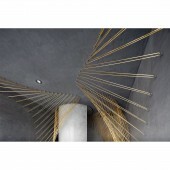 A' Design Award and Competition - Profile: Bilska de Beaupuy Ltd. Profile: Bilska de Beaupuy Ltd.
Home > Designer Profiles > Bilska de Beaupuy Ltd. This is the public profile of Bilska de Beaupuy Ltd., Additional information and high-resolution images are available for accredited press members, to access additional information about Bilska de Beaupuy Ltd. please login as a press member. About Bilska de Beaupuy Ltd. : Bilska de Beaupuy is London architectural studio based on a concept of Nutritious Architecture®. Nutritious Architecture is a holistic term that defines studio’s approach to architecture and its relationships to the human being and the environment. Bilska de Beaupuy designs for the purpose of connecting people to themselves and to the world around them. They create spaces to nourish people's mental, emotional, physiological and spiritual needs. Bilska de Beaupuy is a partnership of an architect and a nutritional therapist, Monika Bilska and Arabella de Beaupuy. Awards received by Bilska de Beaupuy Ltd.
Press Members: Request an exclusive interview with Bilska de Beaupuy Ltd..